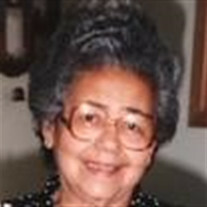 Carmen Rosa Adorno (nee Melendez), age 97, passed away Sunday, October 22, 2017 at Winter Park Memorial Hospital in Winter Park, Florida following a lengthy illness. Born June 27, 1920 in Rio Piedras, Puerto Rico, she lived in New York for many years before moving to Lorain in 1973. Carmen worked as a dietitian at Mount Sinai Beth Israel Hospital in New York and the former Lorain Community Hospital, retiring in 1982. Carmen was a member of Sacred Heart Chapel where she was active in the Crusillo Movement, Legion of Mary, Altar del Rosario and served as a lector. She enjoyed knitting, crocheting, sewing and loved arts and crafts. Surviving are her daughters, Carmen (Antonio) Santiago of Orlando, Florida and Susan N. (Roberto) Vega of Kissimmee, Florida; 6 grandchildren, 14 great grandchildren and 3 great great-grandchildren; a sister, Norma Phillips of Amherst. She was preceded in death by her husband of 60 years, Jose in 2001; parents, Manuel and Juana (nee Santos) Melendez; a son, Jose Antonio Adorno in 1996; brothers, Angel, Luis, Gilberto and Pedrito; and sisters, Leonor and Eliester. The family will receive friends on Sunday from 4:00 - 6:00 pm in the Dovin Funeral and Cremation Specialists, 2701 Elyria Avenue, Lorain. The family will also receive friends on Monday from 9:00 am until the time of mass at 9:30 am at Sacred Heart Chapel, 4301 Pearl Avenue, Lorain. Rev. William Thaden, pastor will officiate. Burial will follow in Calvary Cemetery, Lorain. To send online condolences go to www.dovinfcs.com.